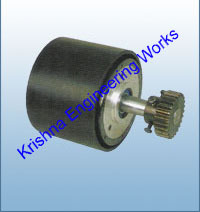 KEW is the most leading manufacturer for Power Brake in India. The offered range of products is widely used to experience and understand the web psychology and behavior. Our products are manufactured and designed using high-quality material and cutting-edge technology for the better development of our products. The resultant flux which is generated , passes through the powder , causing it to align with the flux path , and there by creates a driving bond between input and out put part , the strength of which is solely determined by value of D.C. current applied to the field coil.